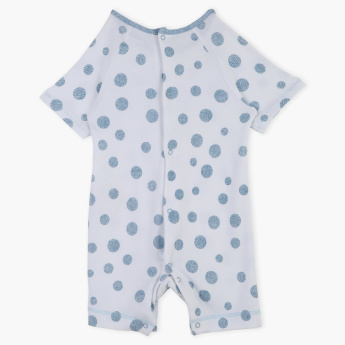 Accent your baby's closet with this charming romper with a polka dots print all over. Soft and comfortable for all-day wear, the romper boasts a delicate frill on the yoke to pep up the design. Features : Pure cotton made short sleeves romper with back opening for easy dressing.